The document below constitutes a formal crime report with respect to documented activities involving former Justice & Customs Minister Christopher Martin Ellison, and former AFP Commissioner Michael Joseph Keelty. This was submitted to the Australian authorities in May 2012 [delivery receipts], by members of the Australian public. Given the multitude of matters identified by investigators, this particular case was selected as "illustrative". A significant number of others could equally have been submitted. It is also recognized that the activities documented were undertaken by a number of individuals, and reports are under development relating to a number of other parties. The submission of a single example enables simplified tracking of the process and response of the government, the Australian Federal Police, and other agencies, for future evidential purposes. The Expendable Project is well aware that the complaint is likely to be covered up, marginalized, and ignored by the Australian authorities. The complaint constitutes two parts. The first PDF represents the formal submission. The second, the addendum, supplements and supports this with self defining evidential detail. The second Expendable Dossier is, in fact, an extended version of this document. These materials should also be supplemented by the additional information published on this website, including video footage and audio interviews. 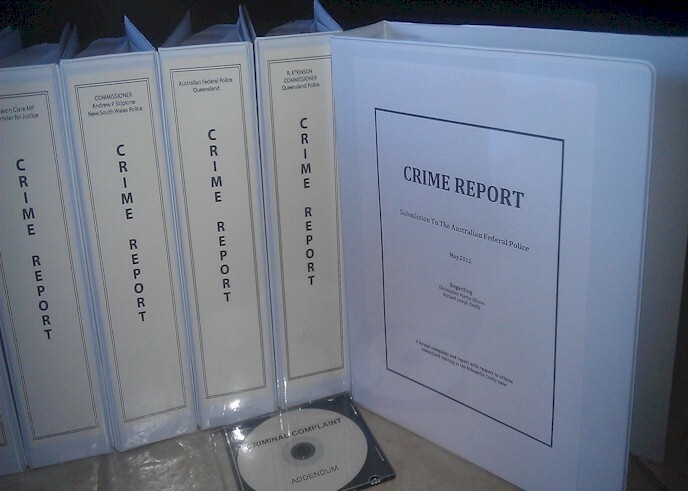 The response to this submission, from politicians, and from a variety of agencies and departments, is documented in detail from the following page: The Crime Report: The Response Of The State.